For Mahseer Fishing: Sari Marog (River Beas), Chamba Pattan (Nearby Jwalamukhi), Kuru Village, Dehra-and Pong Dam Reservoir, Largi (7 km from Aut), Stretch between Harsi Pattan and Nadaun. 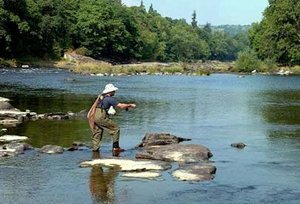 One of the favorite activities of Britons in the colonial year, angling has now become a much sought after recreational activity all over the country. Himachal Pradesh's massive variety and quality of angling have given the state an enviable reputation. The valleys and mountains of Himachal Pradesh known better for mountaineering and other mountain sports are attracting a whole new kind of tourism this year around. All thanks to clean water of Himachal Pradesh, the state is the storehouse of multiple breeds of fishes. The difference between angling and fishing is that 'Angling' is a form of fishing, which is often used synonymously with terms like 'sports fishing' and 'recreational fishing'. Himachal Pradesh is currently a prime destination for Angling and Fishing in India. Currently, Mahseer and Trout are the most sought out fishes for fishing and angling. The Water of Himachal Pradesh is so clear that one can easily see the sea bed and meadows. Sparkling water, clear sky and fishes moving with the flow of water, this completely sounds like a perfect Alaskan fishing experience. Shimla in Himachal Pradesh is the paradise for all the fishers in India. Unlike other places, Shimla is popular for its Brown and Rainbow trout, finest sport fishes in the world which can be only found in Himachal Pradesh. Streams in Himachal Pradesh are divided into two types - General Water streams and Trout Water streams. There are multiple regions in Himachal Pradesh for tourists to enjoy fishing or angling activity. The best spots for trout angling are Rohru in Pabbar Valley, Chirgaon, Barot, Sari Marog, Chamba Pattan and Sari Marog. Talking about fishing- Beas, Sutlej, Ravi, Tirthan Valley, Sainj Valley, Uhl River, Baspa valley and Pabar valley in Himachal Pradesh are the right places to be. Rohru which is around 120 km away from Shimla is probably the best place in Himachal Pradesh for fishing. Even the expert say fishing by Rohru is an experience beyond words. Besides, one can also move towards the Chirgaon region as this is the place for catching abundant Brown and Rainbow Trout fishes. Apart from these, Sangla valley also serves as one of the best places for fishing in Shimla. The river Beas and the Pong Dam reservoir provide attractive fishing spots for the anglers. Before grabbing fishing gear, take proper permission from the authorities. 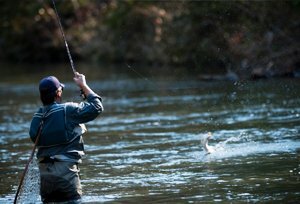 As per the State Government authorities, special license is issued for trout fishing in general steam. From the perennial rivers to the seasonal rivers and majestic glaciers, here are some of the best places to grab fishing gear and experience the tranquillity of fisherman's paradise. Himachal Pradesh is a great destination to fulfil fishing fantasies of every fisher.